This luxe Unreal Fur layer gives your autumn wardrobe the edge it needs. Ginger faux fur (100% Modacrylic). Coat. Long sleeves. Hidden front hook-and-eye closure. Fully lined. Pockets. 33.5" from shoulder to hemline. Imported. Compliments all night. Wore it the next night with ripped jeans low heels and a T-shirt. So cute! I'm short and it didn't overwhelm. It was not too heavy either. The fur falls nicely and is soft and thick. It's a little like they skinned a yeti though. I love this coat. Feels so fabulous when you wear it. It's soft, be prepared for people to pet you all day! It's slightly tighter in the arms, so get your normal size. Wow, this is a lot of coat. 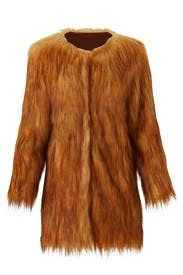 It definitely looked like I killed a Wookie and am now wearing it's skin as a trophy. 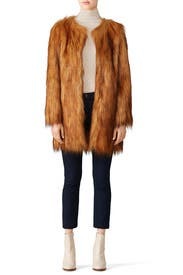 To be fair the fake fur has a lot of variation in color, which is pretty interesting, and it is very warm, so it would be good for winters. I think the arms are a bit long, so it looked less like a coat on me and more like a costume. Glad I tried it but will be returning it. Bought this coat slightly bigger so I could wear it oversized. It was such a statement piece and got so many compliments. I might have to buy it and add to my closer. Lots of room in the arms and super warm. Loved the attention I got from this coat! I felt like such a diva. This is a must have! We hosted a holiday party where every woman was given a free month of RTR Unlimited. It was amazing! This coat is a little goofy. It's rather large, and looks a bit like you've turned into Bigfoot. Quality was fine, but it wasn't really my style. I bought this to wear on Valentine's Day. I really want to WOW by man friend. This runs large! I am sending back the 3x and ordering a 2x. I think I'll end up purchasing this item. I LOVE IT!!! I am a very flamboyant person so this is perfect for me! Wore to an event, got a ton of compliments. Fit is pretty large, very forgiving. I rented this to wear with a sequin dress for my company's holiday party. It didn't go with the dress so I ended up not wearing it. It was a bit snug in the arms. Not unforgiving, but definitely didn't have any stretch or allow for movement. Sleeves were a bit short as well, but I do have long arms. I never closed it, just let it hang open, but there are hooks to close the jacket in the front. Wore with jeans, black pants and short boots - very cool piece - almost bought it and still might! I was so frustrated because I wanted to love this coat. Sadly the cut is not flattering with most dresses' necklines, the coat is not warm at all, and the brown lining peeks out oddly at the neck. 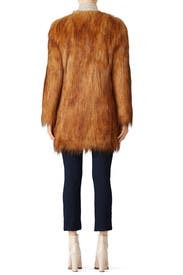 The "fur" is of middling quality, certainly not warranting the price tag if you ask me. Glad I only rented and don't own it. An aggressively average coat. Skip it. I loved this coat, it had a beautiful look and feel! The fur layers hang fairly long and I have pretty short arms, so the sleeves were a bit too long for me as a wheelchair user, the fur was getting caught up when I wheeled. I had originally planned to keep it longer (I have unlimited membership) but unfortunately that aspect just makes it too impractical for me! 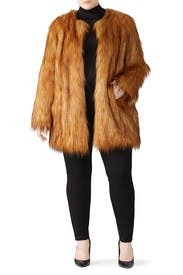 I wanted to try out faux furs before purchasing and I wore this to a brunch. LOVED the look and feel of this faux fur! I wore it to a brunch and then during everyday errands and I was stopped several times about how chic it was. 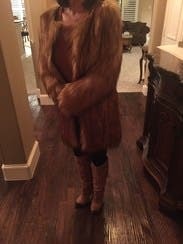 For a (faux) fur, it was lightweight and I felt like a million bucks. Such beautiful coloring and it seemed brand new. I heavily considered purchasing. Love the coat, fit just right , WARM!!! It fits pretty true to size though the sleeves were a bit long on me. It’s a medium weight coat with pockets. This type of item is one reason why we have RTR memberships - you have fun wearing it once then send it back for something new. 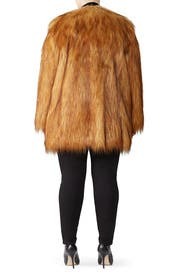 I would recommend this coat for a one time event. I loved this jacket and received many compliments. It was nice to order something out of ordinary and for it to work out. I ordered this jacket for a 70s-style photoshoot and it could not have worked out more perfect. I LOVE this faux fur! It made me standout. I am normally a 2x but size up to 3x because my arms are larger. So the arms fit great and I had plenty of room to wear big sweater. The coat is thin, but the fur will keep you warm. Of course since there is no collar, your neck might be a little cold. This jacket kept me warm and made me look so chic. Big fan. Great fit and absolutely love the color. I've had this coat for over a month and have worn it countless times. It is so much fun and adds flair to an otherwise boring outfit. I have never gotten so many compliments on a garment as I have on this coat. I'm considering buying it but since it's almost spring I may hold off and hope RTR offers it again next winter. Highly recommend!! I didn't wear this for the party as planned as it was a little much for me. Fit was great, but style was a little much for me.